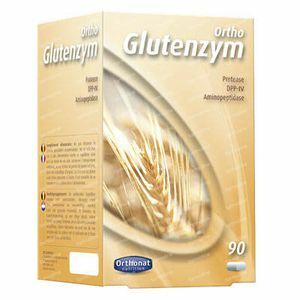 Orthonat Ortho Glutenzym 90 capsules order online. Gluten: This large protein is found in many cereals such as wheat, barley, rye, oats, kamut or spelt. So it is an integral part of our basic food. In particular, it is found in bread and pasta but also in pizza, pastries, sauces and preserves. Gluten is almost always added into ready-made meals to improve their appearance. Gluten gives dough its elasticity and ensures the chewiness of oven baked, cereal based products. Synthesized by the digestive system. Digestive enzymes enable breaking down complex molecules into simple molecules, that the body can absorb. They are produced in saliva, the stomach and pancreas. - Proteolytic enzymes that act on proteins. - Glucolytic enzymes that act on carbohydrates. - Lipolytic enzymes that act on lipids. Normally digestive enzymes have a name ending in "ASE”, depending on the molecule that they transform. For example, proteases digest proteins, lipases digest lipids and amylases digest starch. A protease is an enzyme that cuts the peptidic links of proteins. They are also called: a peptidase or proteolytic enzyme. An aminopeptidase is a class of proteases that catalyzes the cleavage of amino acids by cutting between the first amino acid and the second amino acid in the chain and thus liberates the N-terminal amino acid. 1 to 2 Capsules / Day. Before or during each meal that may contain or contains gluten. 100 mg proteases (500 U DPP-IV, 30000 HUT and 8,5 APU). Voila, finally a supplement I can take daily that allows me to eat some bread, pastries and whatnot without having to worry about my gluten in tolerance.